Please Keep In Mind It`s Just For Fun. All Answers Can Be Found Below Questions. 1. A Cheetah Can Run Up To ? 2. A Group Of Lions Is Called? 3. 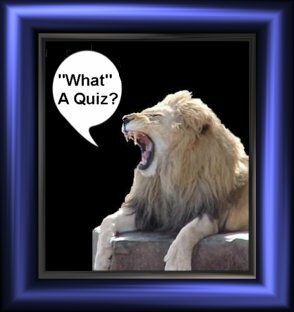 Which Big Cat Can`t Retract It`s Claws? 4. A Tiger`s Paw Prints Are Called? 5. A Lions Roar Can Be Heard From Up To? 6. Which Subspecies Of Tigers Have The Most Stripes? 7. From A Stand Still A Cheetah Can Reach It`s Top Speed In About? 8. How Many Subspecies Of The Tiger Are Recognized? 9. The Tigers Sense Of Smell Is? 10. Which Of The Tiger Subspecies Are Now Extinct?